Here are some answers to questions we commonly get asked about indoor plant care. 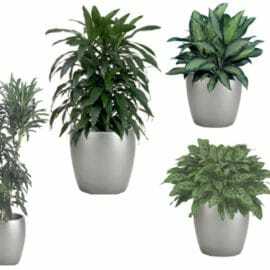 If you have a question that you do not see here, please click here to scroll to the bottom of this page and fill in the plant care question form. We will be sure to email you an answer, and you may even see your questions published here in the future. Question: What are the best plants for my house? Answer: Some of the hardiest plants are the ones with dark green leaves. They can tolerate lower light situations and do even better if they can get more light. But really it all depends on what kind of lighting your plant is going to get. 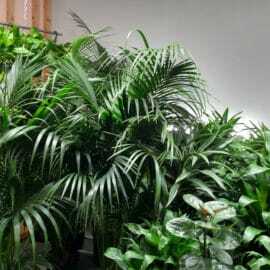 I would recommend Dracaena Lisa or Janet Craig, Pothos (Epipreneum Aureum) and Aglaonema. These are all okay in low light and are, overall, pretty hearty. They are also really good in cleaning the air and eliminating some toxins. Question: The flower on my bromeliad has fallen over. What does that mean? Answer: A couple of things might have happened here. A fallen head makes me think that the bromeliad was over-watered or that someone watered into the cup. Many people say to water into the cup. Unless the plant is in really good light, I don’t agree with that. The water will sit in the cup, causing the flower to rot. I prefer to water the soil. And only every other week. If you water more frequently, the soil will become too wet, and the entire plant will rot. 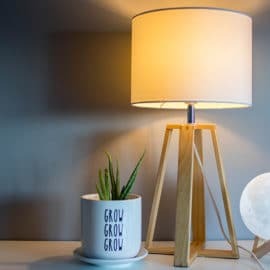 Question: What type of light does this plant need? Answer: Well, first you need to find out the name of the plant. Not all plants need or want the same type of light. A Ficus Benjamina, for instance, loves light and can tolerate heat, therefore, a south facing window would work. But in that same location, a Dracaena Janet Craig, would burn and shrivel. Remember, that the darker the green, the lower the light it can tolerate. Note, I said tolerate (not flourish). It probably won’t grow in leaps and bounds. Just make sure that the plant gets light. Nothing lives in a cave. Question: Do your indoor plants need fertilizer? Answer: Yes, they do. You should use a mild fertilizer (like Schultz Instant Liquid) that is water soluble and that you use at each watering. That way it makes it simple to use and remember. Follow the directions on the bottle and don’t use too much. It will cause the leaves to burn. We begin fertilizing in March and continue until October. You don’t want to use a fertilizer in the dormant season which is November through February. Remember, you need food to grow, and so do your plants. Question: My plant is droopy. Does it need water? Answer: Learning to understand plant language is an art. 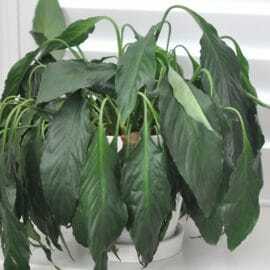 If a plant is droopy, it could mean that it is either over or under watered. Check the soil at the roots, before you water it, to see if it’s wet. You may need a probe to reach deep into the bottom of the pot. If it’s wet, don’t water it. If it’s dry, then water it enough so that a little bit of water comes out of the drainage holes. It should be good then, for a couple of weeks. 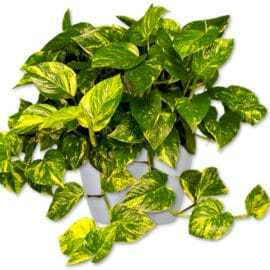 Question: Why do I need to prune my Pothos? 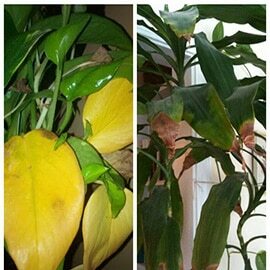 Answer: Have you ever seen a Pothos that has never been pruned? It has two or three runners that just go on and on with no fullness in the center of the plant. Granted, you may like that look, but it is not the best for the health and longevity of the plant. You should cut the runners about one node from the top of the soil. Don’t prune at the end of the runner, as that is where the new growth will start. And you want to prune about 1/3 of the plant at a time. As the new growth starts, prune again. Remember that wherever you prune a plant is where the new growth will begin. If you keep this up (and add a little fertilizer), you will have a beautiful FULL plant again. And those runners that you cut?? Put them in water. Once they begin rooting, you can put them in soil and you have yourself a new plant! Question: When do you re-pot a plant? 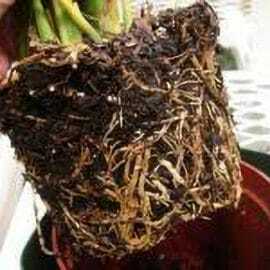 Answer: We will re-pot a plant when the roots are coming out of the holes in the bottom of the grow pot. At that point, the plant is usually looking for more water to offset the amount of leaves it has grown. Lots of plants, however, prefer to have their roots crowded, for example, Dracaenas. And conversely, there are some plants that prefer to have lots of room in the soil, like most Palms. Make sure you are doing what is best for your type of plant, use soil that does not contain wood products and don’t damage the root ball. And add a little prayer that it will adjust to the change. 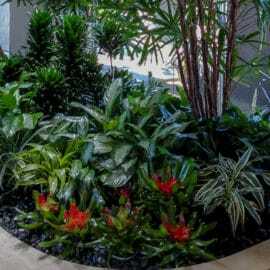 Question: When can I fertilize my interior plants? Answer: We fertilize our indoor plants from March through October. Those are the growing months. 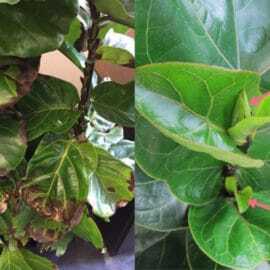 You do not want to fertilize in the winter because the plants go dormant, just like the exterior ones, and giving them fertilizer during those months will cause them to have fertilizer burn (brown tipping on the edges of the leaves). We use a professional product, because we are the EXPERTS, but fertilizers like Schultz Instant Liquid, are good for home use. Make sure you follow the directions for use and keep away from children and pets. Question: How do you keep a bromeliad alive? 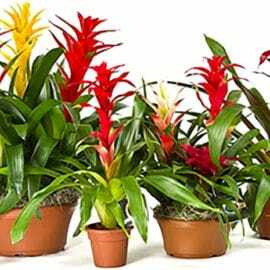 Answer: Bromeliads, like orchids, are flowering plants. The flower is only going to live so long. You can cut the flower out when the color fades and just keep the green leaves. It will take a while for another flower to grow, so you may just want to get a new one. 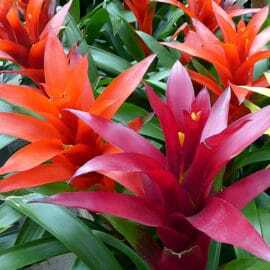 When you first get your bromeliad, dump out any excess water that may be in the cup of the flower. Any water in the cup will cause the flower to rot. After you find a bright location in your home, (not direct light please), you will want to water the bromeliad on the top of the soil with about a half a cup of water. About very two weeks, given the time of year, should be just fine for your bromeliad. Question: Do I need to take my plants outside at any time? Answer: If your indoor plants were grown indoors, leave them indoors. The harsh sun will burn their leaves, if put in direct sun. Plants like it better when you put them in that one perfect spot and just leave them alone. Maybe rotate them every now and then, but they will acclimate. Unless they are just not the right plant for the location you put them in. But that’s our job. We put the right plant in the right location…and we guarantee it! Question: What do brown and yellow tips mean? Answer: It means you need to know how much water your plant needs. Brown tips typically mean that the plant is receiving inconsistent watering. In other words, you are watering the plant when it does not necessarily need water or if it really does! If you touch a brown end, it will either be crunchy or supple. If it is crunchy, it means that you are not watering enough. If the tips are supple or soft, it means you are over-watering. And usually those supple tips will be turning yellow and brown. Before you water any plant, feel far down into the plant soil. If it is dry, then water. If it is wet, don’t. I know, easier said than done. Do You Have An Indoor Plant Care Question? All provided information is kept private, and used solely for Inside Plant’s use in responding to your inquiry and mailing list.